Most of my characters have been set apart from others in some way. A bullied child is an isolated child, and reading was my escape. Not only did it allow me to learn about other cultures, but books led me on a journey into our human past and even into the future. What I learned is that there is more that humans have in common with one another than what racially, ethnically or culturally separates us. The kids who bullied me acted out of ignorance that had been passed down for generations. I was lonely, but gained strength from my isolation; I learned to make my own path. 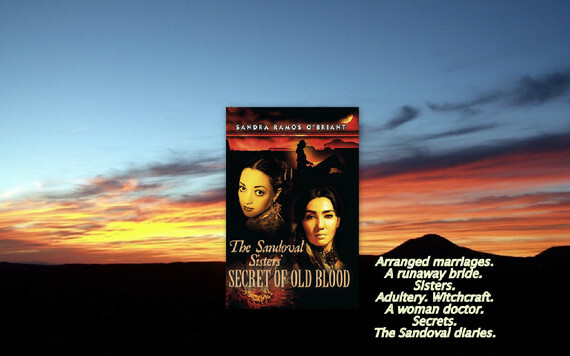 My first novel, The Sandoval Sisters' Secret of Old Blood, won two literary awards. It tells the story of Anglo encroachment on New Mexico as they made real their vision of Manifest Destiny. That's the long way of saying that I began my historical research to answer the burning question that had so cruelly affected my youth: Why did the Latino kids in Santa Fe hate Anglos, especially Texans? Answering this question led to an examination of war, class, education, the role of women, religion and superstition during the Mexican American War. Santa Fe, NM, an area now known as an artistic and tourist mecca, was the first foreign capital conquered by the U.S. It had a profound impact on the people there. The war is the backdrop for the Sandoval sisters' individual coming-of-age stories in which they cope with racism, sexism, political intrigue and the power of superstition. The Sandovals are isolated because of their wealth and education. The eldest sister, Oratoria, was a Mexican peasant (most likely of mixed ancestry) adopted into the family. The other two sisters can trace their heritage back to Spain. Alma runs off with a Texan and experiences racism while living with his family. She is also gifted/afflicted with the "Sandoval memories." The youngest sister, Pilar, insists on wearing men's clothes and working with horses. All of these family attributes set them apart from the people (la gente) in their community and make them targets when the war wreaks havoc and loss. Over twenty of my short stories have been published. Some stories don't have identifiable Latino characters. Against the Rules, which tells the fictionalized story of how I met my husband, does not. Personal Power does. What both stories have in common are strong voices and characters who have defied the odds or are about to defy them. Not all of my stories have erotica in them, but when they do there might be a bit of sexual fluidity, as with Pilar in The Sandoval Sisters. Alexandra: "Their blood was not our blood, but we became Sandovals... they were set apart, and so were Phil and I. We played with the other children and eventually flirted with them, but we were not the same. Our Anglo last name disappeared and we became the Sandoval children on every legal document of that time, but we were not la gente. We were the children of the Sandoval witches. The community would not forget the old blood." Want more diversity? I'm editing a vampire novel that I sold once, but the small press went belly-up before I could deposit the check. Title: Blood Mother. When I'm actively writing a new piece, the story plays out in the back of my mind like a movie-while I'm driving, on hold, in my sleep. I see it. My job is to put it into words so that my reader can see it, too. If I get stuck, it's not because I don't know where to take the action, it's in finding the best way to describe it. When this happens I usually change perspective by working out, gardening, walking the dog or switching to a short story. The human brain is a marvelous machine. It knows what you want it to do but for some reason the words may come out of left field. I'll be talking to my sons or husband or at lunch with friends and in the next moment I'm scribbling on the back of an envelope or a credit card receipt. My thanks again to Claudia Long for tagging me for this exercise. She is the author of Josefina's Sin (Atria/Simon & Schuster 2011) and the forthcoming The Duel for Consuelo. I've tagged Mona AlvaradoFrazier to continue the diversity series. She was an Amazon Breakthrough quarterfinalist for her Young Adult novel: Strong Women Grow Here.